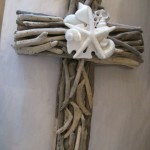 My wonderfully natural cross is made with genuine driftwood. I then embellished it with a white Arrowhead sand dollar, a shiny white Vole shell, a pearlized Turbo and a white starfish in the center. I also added a cut Turritella shell, a white Abalone, and a white Spindle shell. It measures 20 inches long by 13 1/2 inches wide, and 5 inches deep. 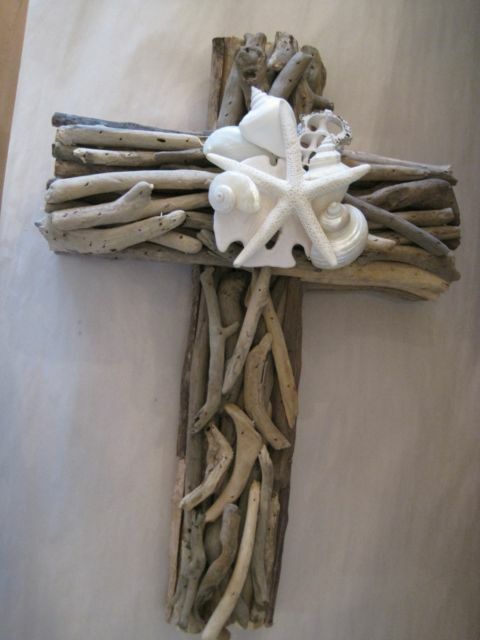 This driftwood cross has a hook included on the back for easy hanging on a wall. It is a great and unique accent piece to any room in a beach house, or to add some coastal decor to any home!